Survivor: Borneo (2000) - 9th place, 8th out- 1st juror. Voted out in Episode 8, "Thy Name Is Duplicity" (Day 24). Borneo Ep. 3 IC: "Rescue Mission" - One of Pagong's primary stretcher carriers, Pagong wins. Borneo Ep. 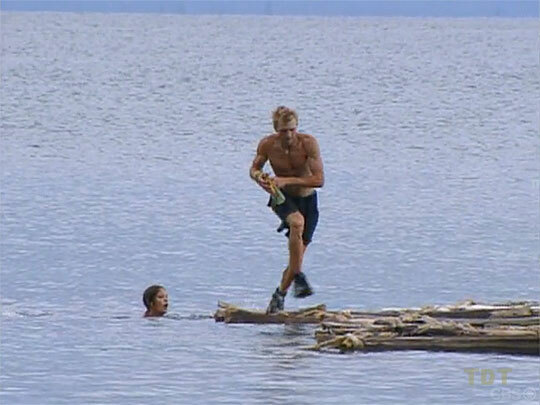 4 IC: "Buried Treasure" - Crosses the floating bridge and paddles, but Pagong loses. Borneo Ep. 5 IC: "Shipwrecked" - Early rescuee/paddler, and Pagong wins again. Borneo Ep. 6 RC: "Abandoned Barracks" - Sits out, as Pagong wins. Borneo Ep. 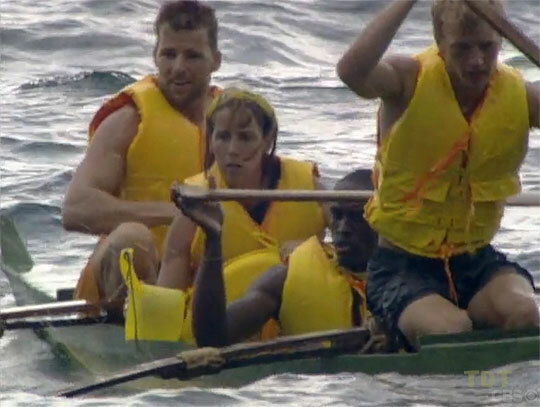 6 IC: "Obstacle Course" - Joins the race at the midpoint (with Gretchen), but Pagong loses. Borneo Ep. 7 IC: "Snake Island Relay" - Second in the first round, and Greg wins round 2 (1st/10). Borneo Ep. 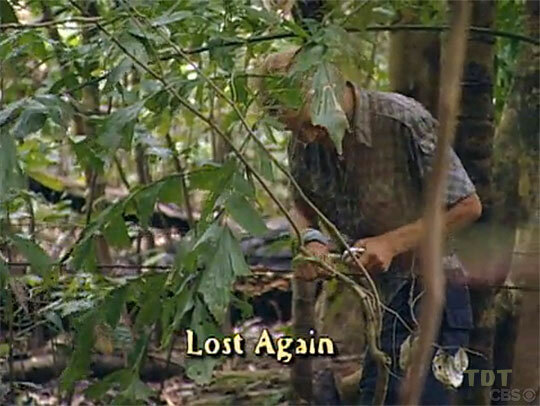 8 RC: "Survivor Archery" - With a single arrow shot, Greg wins a video from home (1st/9). Borneo Ep. 8 IC: "End of the Line" - Gets lost (again) after the fourth of five stations (4th?/9). Borneo, Ep. 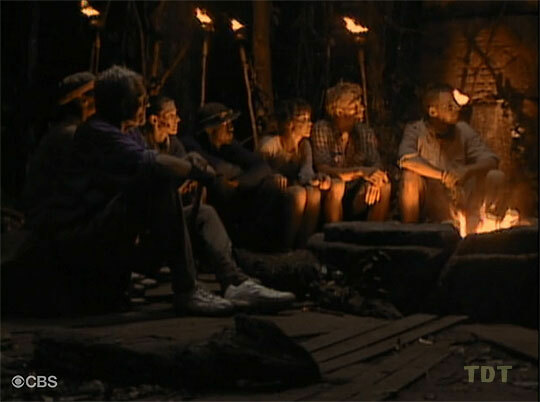 8: Six votes, from Richard, Kelly, Rudy, Sue, Sean, and Jenna (voted out, 6-3). Borneo, Ep. 13: Voted for Richard Hatch (who won, 4-3). Like a mama bird. Or a daddy bird. Oh, hello. I didn't see you there. Ep6. So long, Tagi! I raise my hard-won chocolate to you! Watching Joel talk to the ladies. Pagong arrives at the Ep6 IC. Not worried about the merge. Whatever happens. Eh. He just barely beat me! I don't care for alliances... ooh! Flying fish! Greg wins reward (after shooting one arrow)! Snuffed, Ep8. The fake tears are flowing. CBSNews.com article (partial transcript of The Early Show, 7/20/00): "Dishing Survivor"
"Born in Plano, Texas, Greg Buis is one of four siblings (two brothers and a sister). He studied anthropology at Brown University, graduating in 1999. He is currently based in Gold Hill, Colorado, although he continues to travel around the world. He has lived in Ridgewood, New Jersey; Providence, Rhode Island; Boulder, Colorado; Santa Barbara, California and Australia. Along the way, he has been employed as a survival skill program director, boat mechanic, a stone mason and a restaurant manager. Greg describes himself as energetic, hardworking and dedicated. His favorite color is green and he loves the smell of a pine forest. He says his perfect day would entail stalking a wild animal slowly and quietly enough to surprise it by touching it. His birth date is Dec. 31, 1975."